Are you sick of treating your dry and damaged skin with lotions and ointments that never seem to make a big difference? If you have persistent dry skin, using the same old lotion might not be enough. It’s time to not just treat the symptoms of your dry skin, but get to the root of the problem and heal it once and for all. To do that, you’ll need an all-natural balm that’s formulated to moisturize and protect your skin. 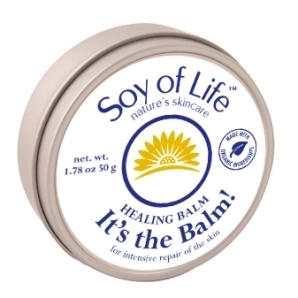 That’s exactly what Soy of Life’s product, It’s the Balm, is designed to do. It’s the Balm will not only treat the painful and irritating symptoms you suffer from dry skin like itching and peeling, but it’ll work to heal your skin at a deep level, helping prevent future irritations and dry skin. It’s the Balm is formulated from all-natural ingredients, including a range of oils, including soy oil, sunflower seed oil, wheat germ oil and rejuvenating camellia seed oil, along with lavender, mandarin and helichrysum essential oils. There is also beeswax, shea butter, vitamin E and cocoa butter, as well, which all combine to allow this creamy, soy-based balm to offer a range of intensive repairing properties that will work to soothe, repair and protect your skin. The ingredients are also known for their restorative properties, and the balm can even help minimize and heal scars and stretchmarks. It’s the Balm is perfect for dry and cracked skin on your elbows, knees, hands and heels, and can help you restore the softness, moisture and smoothness to skin anywhere on your body. Place your order now and see for yourself how It’s the Balm can help your skin today! Order with some of our other great products and use coupon code FREESHIP at checkout to receive free shipping on your order of $50 or more. Learn more about any of our products by calling us today at 877-SOY-FOR-U.